It begins: this equalizer against Chelsea changed everything. The world first heard of him on a cool September night in 2013, seventy minutes into a Champions League game between Chelsea and Basel. Trailing 0-1, the Swiss champions were mounting a quick counterattack. Left-back Kay Voser crossed the ball into the path of two of his teammates, they picked it up, Matías Delgado laid off a simple pass to Marco Streller and the veteran striker has found completely unmarked teammate in the right corner of the penalty area. A left-footed shot followed and that was it: in his group stage debut, Mohamed Salah has scored his first UCL goal. Two months later, in Basel, history repeated itself. This time, the hosts desperately needed a win to keep the group promotion race with Schalke alive. For over 80 minutes, Murat Yakın’s players were laying siege to Petr Čech’s goal, registering fifteen shots to Chelsea’s one and forcing five saves out of the current Arsenal goalkeeper. Eventually, a long, diagonal pass from Fabian Schär has found it’s way past Branislav Ivanović and met sprinting Salah – only to land in the bottom-right corner of the net. Curiously enough: this happened just a couple of seconds after Kevin De Bruyne has entered the fray for the visitors. Mohamed Salah Ghaly. Two years earlier, he saw the reminder of his Egyptian Premier League season cancelled and was forced to take part in various friendlies to maintain match fitness. Now, following a string of superb Champions League performances, he was moving to London for £11 million and competing for Chelsea’s starting XI with the likes of yet-to make millions in China Oscar, yet-to win the World Cup André Schürrle and yet-to score against Barcelona Willian. Again, the Egyptian has passed De Bruyne by – five days earlier, the Belgian has ended his disappointing spell at The Blues by joining Wolfsburg. Meanwhile, his Egyptian colleague’s career has hit the brick wall. Mo’s maiden Premier League goal has been heavily overshadowed by other circumstances. The day he put a strike past Wojciech Szczęsny, Chelsea annihilated Arsenal 6-0 in a game that saw the wrong Gunner being sent off for a goal line handball. After that and a very, very good home performance against Stoke, Salah dropped further and further in the pecking order. For the half of that triumphant, 2014/15 campaign, the forward from Basyoun watched Willian from the bench; then, his manager effectively traded his services with Fiorentina for the signature of Juan Cuadrado. Today, three years and five days have passed since Mo’s another memorable moment. 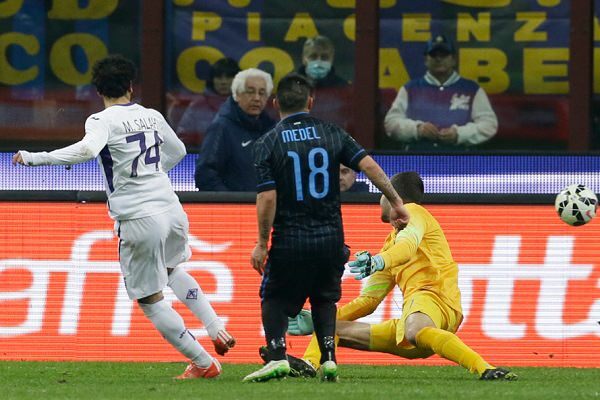 Viola were visiting San Siro in an important six-pointer, which later turned out to determine the Europa League qualification slot. On the pitch: ageing Inter stars like Nemanja Vidić or Lukas Podolski, mixed with the up and coming starlets of Mateo Kovačić and Mauro Icardi. The Egyptian Messi needed a stroke of luck to make it out there: without Khouma Babacar’s 43rd minute injury, he’d have likely played only a tiny cameo. Instead of that, he capitalized on Samir Handanovič’s handling error inside 55 minutes to secure his side a crucial, 1-0 victory. Handanovič spilled it. The misfortune of some is the luck of others. This time, a lot of stars have alligned to help Salah. His short spell at Artemio Franchi was just enough to earn him another Serie A loan, to Rudi García’s Roma. Then, six months into it, the French boss has been sacked and the Chinese from Hebei Fortune had a bid for ASR’s first-choice winger, Gervinho. Without a squad rival breathing down his neck and under Luciano Spaletti, who trusted his Egyptian unconditionally, Salah finally flourished. After scoring fourteen league goals and adding eight assists on the top of that, the winger’s been voted by fans as AS Roma’s 2015/16 Player of the Season. The last doubts about this man’s ability have been silenced forever during Roma’s Champions League clashes with Bayer Leverkusen. In an eleven-goal, two-legged frenzy, Mo has turned out to be the main destructor. Wendell, probably the best left-back B04 had in years, could barely see his opponents’ movements, let alone track him or take the ball from him. 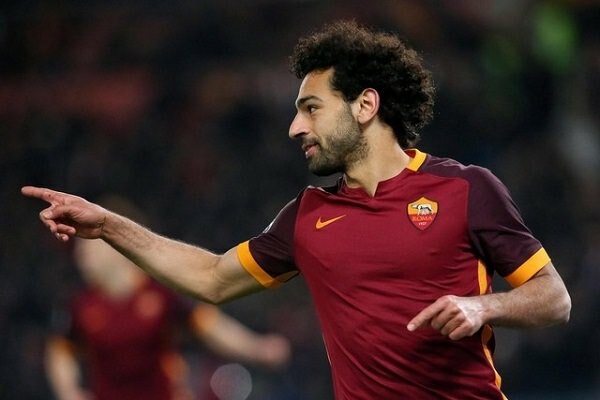 In Germany, only a last-gasp comeback has saved the Aspirin club from an embarrassing defeat; at Stadio Olimpico though, Salah pounced inside only two minutes and when the visitors struck back to make it 2-2, he won a crucial penalty which inspired a tumultous, 3-2 victory. Wendell having just a rough, rough time dealing with Mohamed Salah's brilliant pace. A year later, Mo’s good moments were so plentiful, it was difficult to even count them all. He’d open the season with a goal and an assists against Udinese; soon after that, more of the same followed at San Paolo fortress, where Napoli fell 1-3 and the Egyptian totally mugged off Kalidou Koulibaly to set up the opening goal. Then, there was a hat-trick when Bologna came to town; after that, two assists in Crotone and a goal in a 4-1 hammering of Torino. Despite being criticized for being wasteful with goalscoring chances, the forward completed the 2016/17 run with the hand on 34 goals in 41 competitive appearances. Finally on fire, cutting through Serie A like hot knife through butter. Which leads us to hear and now. 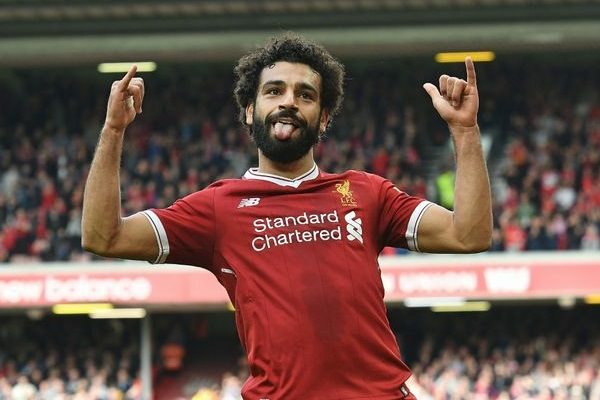 As we speak, Liverpool superstar Mo Salah is scoring one goal per each 95.5 minutes of Premier League action. He’s the only one keeping up the pace with usual suspect Harry Kane in a race for the Golden Boot. He scores all kinds of goals: from cold-blooded one-on-ones, through technically difficult shots, up to mind-boggling dribbles past every player standing in front of him. It’s only March and his left leg is already the deadliest left leg in the history of English top-flight. Twenty four goals in just 6 months and 19 days since getting back to the PL pitches. World. Class. In hindsight, no one should really be surprised. If there’s a one team in England that knows how to utilize the pace backed up by terrific technical ability – it’s Jürgen Klopp’s Liverpool. Last season, we’ve experienced that with Sadio Mané, whose career has been recently hampered by knee and hamstring injuries. This year, Mo is taking over the role of Senegalese international, immediately finding a football soulmate in hard-working false number nine, Roberto Firmino. Those two are the main reason why the winter sale of Philippe Coutinho to Barcelona has gone completely unnoticed. But this could be only the beginning. At 25 years of age, the Egyptian might still have his actual masterclass ahead of him. With an outrageous turn of pace and Robben-like ability to squeeze in the shots after cutting inside, Salah would add an entire new dimension to about any team in the world. Already in January, Real Madrid were rumoured to be interested in him. At the same time, Roma’s director of football, Monchi, has admitted that he should’ve demanded more than £37 million from Liverpool. 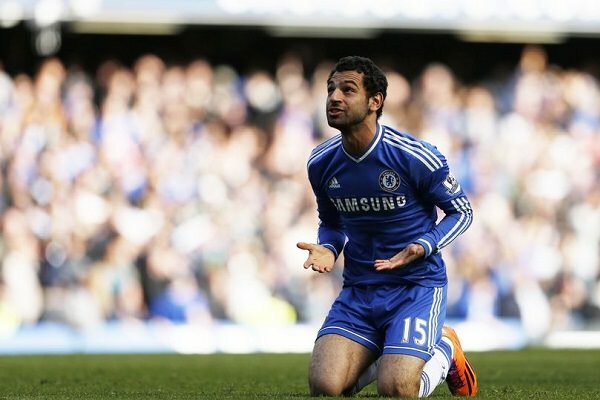 One thing’s certain: if the Egyptian leaves England next summer, it will be a £150+ million deal. Liverpool – final destination or just another stop en route to greater glory? As of now, he’s doing wonders both on and off the pitch. It’s his donations that helped a cancer-struck Egyptian kid to have a life-saving bone marrow surgery. He’s also forked out £27,000 to a charity helping the families of retired Egyptian footballers and sponsored the construction of a school in his home city. After his match-winning performance for Egypt against Uganda, Mo also turned out a luxury mansion from the businessman Mamdouh Abbas, asking his wealthy fan to donate that money to the kids in his country. Simply speaking – a perfect ambassador for a troubled but joyful country. But the joy has just begun. The title is beyond Liverpool’s reach but they’re still well in contention for the Champions League title and a second-place league finish. The reigning African Footballer of the Year and Arab Footballer of the Year might as well light up the Middle-Eastern football community again. And, according to 2016 stats, there are roughly 400 million people praying for Mo’s ultimate success. It worked this weekend too – he scored one past Newcastle.